Cadott will once again be the preferred home for rock music this summer. Since 1994 Rock Fest has brought some of the biggest names in rock music to the area and it definitely continues that tradition this year. The 2017 explosive lineup features AVENGED SEVENFOLD, ROB ZOMBIE, and SLAYER. “We’re extremely excited to continue to be able to put on such a massive event for rock fans,” says Wade Asher, Promoter of Rock Fest. “This year’s bill features a great mix of current and past rock acts including some unique performances we’ve never had in Cadott before including INSANE CLOWN POSSE, VOLBEAT, LAMB OF GOD & the legendary SLAYER”. When talking about AVENGED SEVENFOLD, the media always mentions the impressive stats, which include a string of best-selling albums, among them two consecutive No. 1’s on Billboard’s Top 200 Albums Chart along with Diamond, Platinum and Gold awards for album sales in nearly a dozen countries and a series of No. 1 radio singles. More than fifteen years after the release of their debut album, AVENGED SEVENFOLD has become a band whose sound and vision has broken through obstacles of language, distance and culture. Their newest album, The Stage, hit number 1 on Billboard’s Alternative, Rock and Hard Rock Album charts. As a rock icon and filmmaker with a unique vision, ROB ZOMBIE has continuously challenged audiences as he stretches the boundaries of both music and film. He has sold more than fifteen million albums worldwide, and is the only artist to experience unprecedented success in both music and film as the writer/director of seven feature films with a worldwide gross totaling more than $150 million. Thirty-four years in to its career, SLAYER remains the preeminent punk-thrash band that helped establish the genre and that up-and-coming metal bands continue to revere and emulate. SLAYER is a five-time Grammy Awarding-winning metal juggernaut that writes songs which mirror the turmoil and aberrations of our society. Repentless, the band’s first new album in six years, continues the Slaytanic offensive. 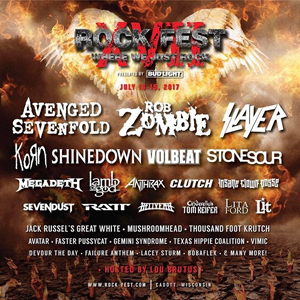 Rock Fest 2017 also features: KORN, SHINEDOWN, VOLBEAT, STONE SOUR, ANTHRAX, MEGADETH, INSANE CLOWN POSSE, and more than 65 bands. Visit www.Rock-Fest.com for the full lineup and information. Tickets, campsites, and fan pit passes are on sale now HERE or via the Rock Fest corporate office at 1.800.326.FEST. VIP sections have sold out the last four years and are expected to sell out shortly. A City literally built on Rock n' Roll in Cadott WI, Rock Fest is the true Rock experience you can't miss. In its 24th year, it is the top venue for people of all ages to come together for one common purpose: to congregate with other rock fans from across the world, in a place where rock music still matters. Rock Fest is set on 320 acres of picturesque land in Central Wisconsin, and is home to nearly 7,000 campsites all within easy walking distance of the campground. With major airports and hotels nearby, as well as daily shuttle service, there is literally something for every rock music fan. Experience it for yourself to find out why Rock Fest Fans keep coming back every year to the largest Rock & Camping Festival in the US.